For a link to the 2019 designs and the new COOKIE BINGO, please click here! 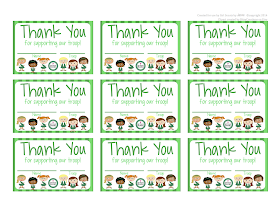 Here is a more generic set of Girl Scouts Thank You cards (not specific to Daisies, Brownies, etc.) Click HERE to download or on the image below! New design (including all other levels), click HERE. In order to keep these printables FREE, I do not offer customization. Please visit my Etsy shop for custom order inquiries! Seriously, I have gotten so many compliments on them. :) Again, thank you! 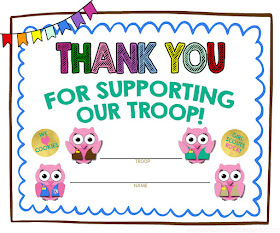 Thank you so much for sharing your wonderful ideas an printables!! Ridiculous question but need to verify; Our girls put their names on the thank yous correct? Not the persons name who purchased? Hi there! I love the new 2019 narwhal cookie box wraps, but was looking for the label version. Do you have labels available in the same style? Thanks so much! Jamie, thank you so very much. These were a life saver today. I was trying to pull together a Junior meeting to sort cookies and I'm having the girls cut these out and attach to their bags. I'm so grateful.